Ryan will do more thorough posts about the curriculum, the activities, and the effectiveness of the program when all the classes are complete on ideonexus.com. These are just my own personal recaps and memories. 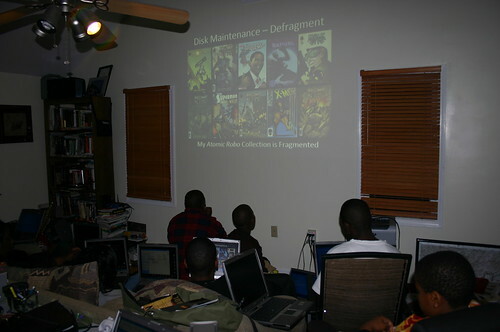 The fifth class for the Computer Literacy Program was on “Maintenance”. The day of class, Tropical Storm Ida came through Elizabeth City and flooded our street. Schools and events were canceled across the region. And yet, we still had 11 out of our 12 students show up! (To be fair, a majority of them were already over at the house precisely because schools were canceled). This class was a pretty busy one because we had hands-on activities throughout. We started off by checking for and installing new Windows Updates. Next we showed them how to check their hard drive for errors. Check Disk took a while (particularly for the student who had infected his system with Malware two weeks ago by visiting some no-no sites), but while they waited the kids still managed to find stuff to laugh and smile about. Believe it or not— the defrag section was quite fun. Ryan explained it using a collection of comic books. At first, his Atomic Robo collection was dispersed among his other comic books, making it slower and harder for him to find all the issues. After “defragging” his comic book collection, all the Atomic Robo comics were together and easier to retrieve. 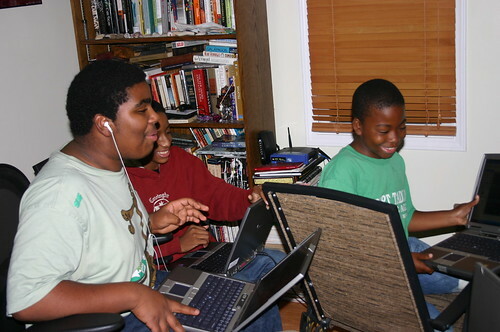 Since their laptops are so new, there is very little on the kids’ hard drives and relatively few fragmented files. But they had just enough to see the process in action. “I see it!” One girl yelled and pointed at a section that went from red to blue. Next up we talked about virus scanning and firewalls. As continuing education on file types and extensions, particularly the ones they should not open via email, Ryan introduced them all to a batch file. It was a FORK BOMB! The kids opened it and watch as it recursively called itself over and over and over until their computers crash. I found great amusement in watching all their reactions. “Oh SNAP!” one boy exclaimed. During the hands on activities in class, I’m doing a lot of bending over and squatting and pointing to help the kids out. Sometimes when one student figures something out, they lean over and deploy that knowledge to the others around them. It always makes me smile to see them helping each other. Don’t worry about me becoming obsolete though– I’m still plenty busy! 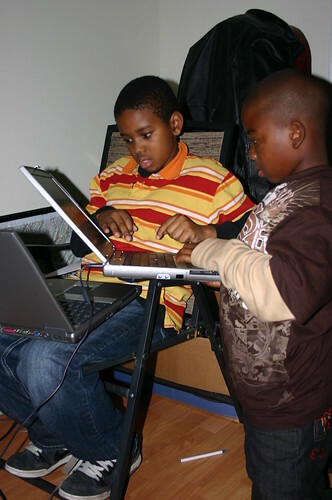 The fourth class for the Computer Literacy Program was on the output of Class 3’s topic. Programming begets Software! To start, Ryan discussed operating systems. He covered the key functions of operating systems and then discussed the variety of the OSes that are out there, making sure to emphasize there are more options than just Windows and MacOS. Before we purchased the 13 laptops for this program, the kids all had to share from a pool of extra laptops we had around the house. One of those laptops runs Ubuntu. 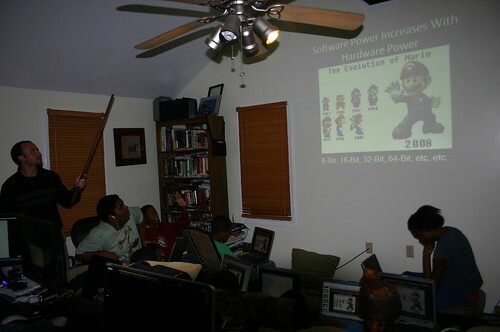 So through their nightly visits to MySpace the past year, the kids already had been exposed to Windows and Linux systems. For class we wanted them to experience a new operating system. The easiest* way to do that was to have them all drop to DOS prompt and run some commands. Everyone was able to follow along with the DOS prompt activity, but I’m not sure how well absorbed it was. It may have been a little like Cargo Cult Programming. The kids were running through their cd and dir commands, but I didn’t see anyone light up and visibly recognize that they were looking at the same files they were looking at in Windows. Ryan and I discussed it and we already have a slide idea for the future to help solidify the connection. More effective was Ryan’s discussion on how software power increases with hardware power. He got help from Mario (of Nintendo fame). Over his 14 year career, Mario has appeared in over 200 video games…and was a great illustration of the changing technologies. Near the end of class, Ryan discussed software applications and licensing schemes. Then it was time for another hands on activity! 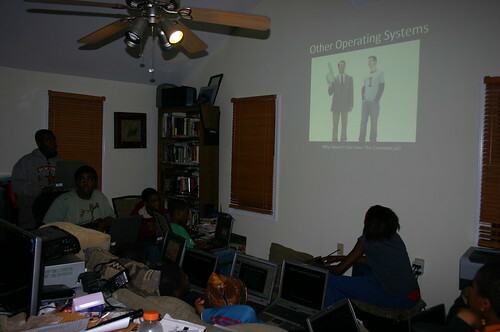 They kids got to install a program, specifically GIMP, the GNU Image Manipulation Program. We walked through the install process together. Next up, lab time! 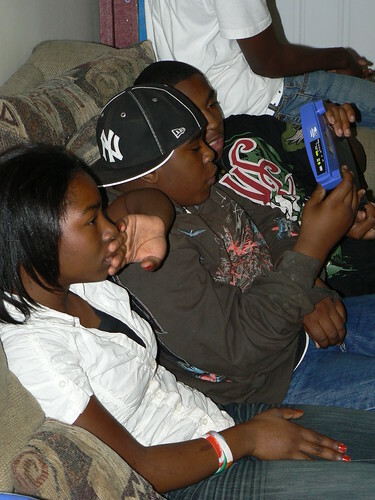 The kids were tasked with learning and using their new program. GIMP was a home run! All the kids had great fun modifying images and sharing their work with the others. A lot of laughter was had. When class was officially over and everyone was free to peruse the internet, a number of the kids continued to work on their images. 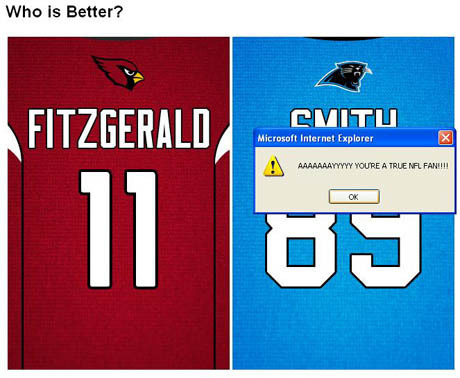 The Larry Fitzgerald and Steve Smith debate served us well during the Programming Class. 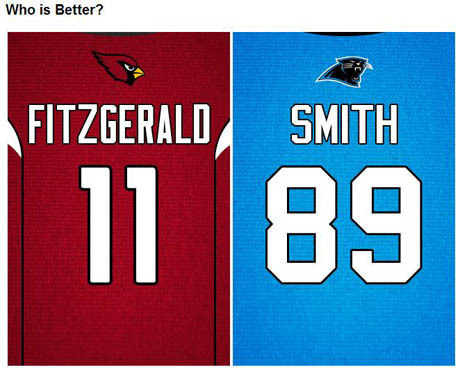 The debate lived on as the Larry Fitzgerald fan made some choice modifications to a picture of Steve Smith. All in all, another great class! 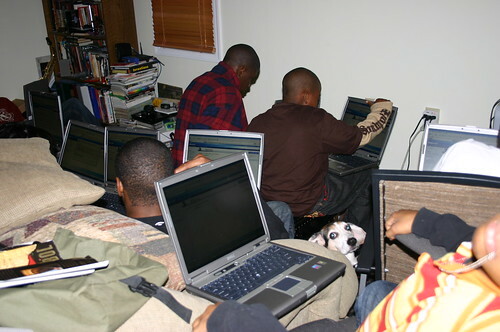 Last week I mentioned that Henry and Jimmie have been auditing the Computer Literacy classes. Henry is a bred pack animal, so he does fancy being in groups. Here are two shots he snuck into. One from our class on Software and one from our class on Maintenance. Enjoy! Life has been going well. It has been going really, really well. Surprisingly, this positive phase has been accompanied by a frustration. I am so full of love and happiness and gratitude that I struggle to articulate my feelings. No matter the word choice, it feels impotent. Sometimes I try to prefix my sentiment with words like “very” or “really” or “so” (see above). Other times, I try to reinforce the magnitude of a statement simply by saying it again and again in succession (see above). Those tactics fail and everything I say still seems to fall far short of the feelings inside. Designers, I am more proud of you than I can adequately express. And that’s it! That’s exactly how I feel! Tim Gunn is known for his vocabulary and is sometimes described as a walking thesaurus. Yet here words even failed him! By simply admitting the emotion exceeded his (albeit formidable) communication skills, he conveyed more than intensifiers and relentless repetition ever could. I will never design a fancy gown or even a sassy ensemble of separates. Nonetheless, I still found guidance from mentor Tim Gunn. Now I know what to say! 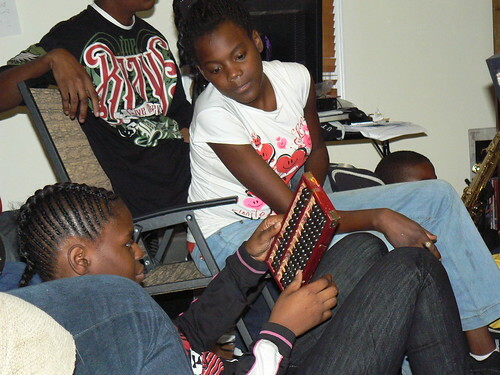 The third Computer Literacy class was on a topic near and dear to my heart– programming! Since we are doing the Computer Literacy Program out of our home, both dogs have been auditing the classes. 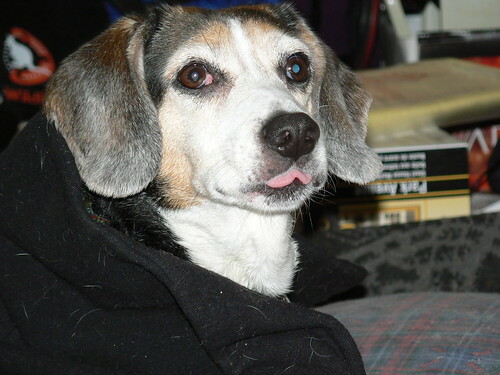 But this is the first time a dog has helped with a lecture. Our first stab at explaining Logic Gates produced some pretty confused looks, so we elaborated using examples of people in the room. When the kids got a hang of the concept, we used Henry, who managed to squish himself between the students on the couch, as a quiz. “HENRY IS A DOG AND HENRY IS ORANGE” I said. “FALSE!” All the kids yelled. To help demonstrate if statements, loops, variables and algorithms, Ryan had five kids each pick from a deck of cards. With a sixth kid acting as an index variable and another as a boolean flag, we walked through a live-action bubble sort in the living room. In the end all five card-carrying kids were lined up in order. As soon as we started working through the examples in the directory, the kids noticed there was a file named “02SteveSmithVsLarryFitzgerald.htm”, so it built up a bit of a buzz with the boys. Before long, we got to that example. The kids opened it up in their web browser and started selecting. The boy who liked Larry Fitzgerald was one of the first to click. A popup box declared that he was smart. He got a smug smile on his face, sat back on the couch and waited for his nemesis to react. 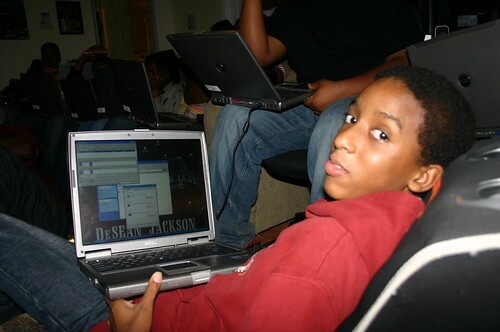 The boy who favored Steve Smith clicked and was not pleased when a popup announced that he was wrong. I nodded and he was even more appalled. 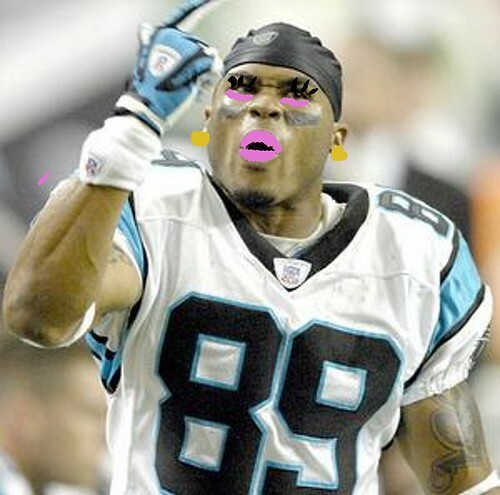 In a heated tone, he started to detail why Steve Smith was superior to Larry Fitzgerald. Everyone opened the source code into WordPad and [with some hints] found the code that was responsible for the taunts. Then each child typed in what he/she wanted to see (One girl who didn’t like football at all changed both of her prompts to read “Who Cares?!?”). They saved their changes, reopened up the page in Internet Explorer and [with some minor debugging here and there thanks to single quotes or inadvertently erased semi-colons….] each child got to see popups that matched his/her views. 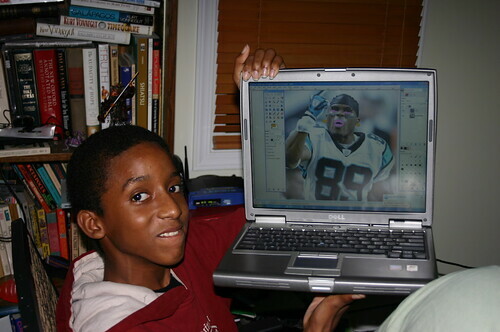 Now the boy who liked Steve Smith was much happier. AAAAAAYYYYYY YOU’RE A TRUE NFL FAN!!!!! When I was in college and first dabbling in HTML, I remember how exciting it was to refresh a page in Netscape and see a change that I had made. Even if it was something simple like a background color, it was thrilling. I told the browser to do that. That was my doing! That was my favorite moment of the night. The first class on The Bit was so busy and hectic, I didn’t get to take any pictures. During this second class on Hardware, I was able to snag some shots. For this class, Ryan started off with the history of computers and how the word “computer” used to refer to humans instead of machines. 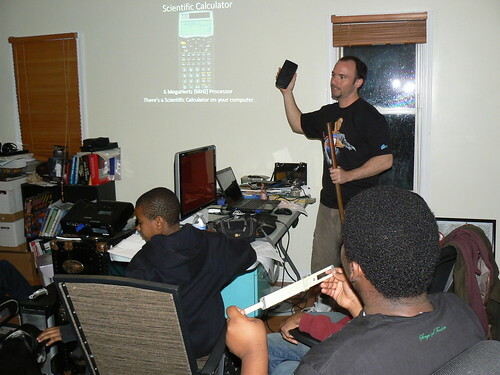 Ryan also talked about other types of computers– the abacus, the slide rule, the scientific calculator. And by no coincidence, Ryan had an example of each to pass around the class. The lecture then covered computer history from the ENIAC to the UNIVAC to today’s Kraken. To drill home just how far computers had come, Ryan pointed out how powerful today’s tiny cellphones are compared to the giant computers that used to take up entire floors. The lecture ended with a dissection! Ryan took apart an old computer, opened it up, explained the various parts. A wireless router made the rounds as well. At least twice during lab time, I heard a “Vicky Look!” from across the room. I would turn around to see a child grin as they switched from Notepad to Internet Explorer using Alt-Tab. They were so, so proud. 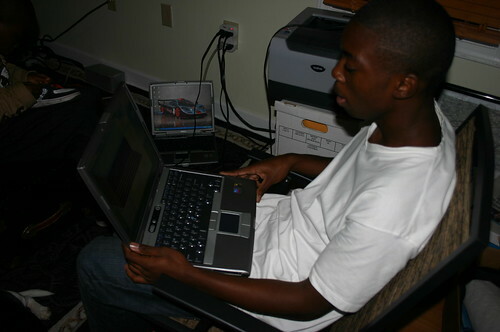 More pictures of the Computer Literacy Class are on my Flickr site. 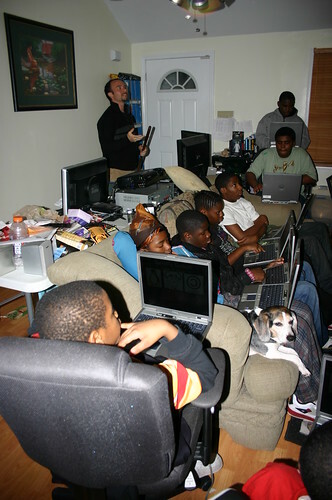 For some time now the neighborhood kids have been coming over in the evenings to use some extra laptops to get on the Internet. My fiancé, Ryan, decided to start an official and structured computer literacy program. 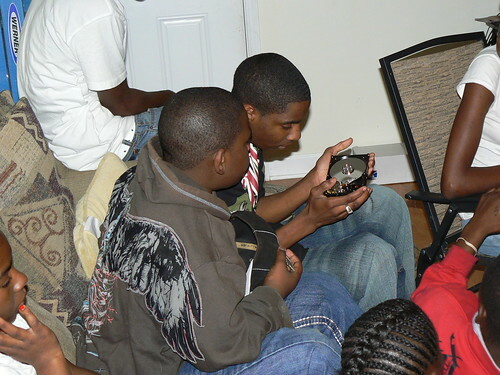 After roughly a year of planning and research, Ryan developed a curriculum of twelve classes and we have started a pilot run with twelve kids (Ages 9 -18) from our street. Since this was the first class, I wasn’t sure what to expect about the kids’ engagement level, but Ryan did an excellent job keeping them involved. Ryan routinely asked questions and the kids would shout out their guesses. 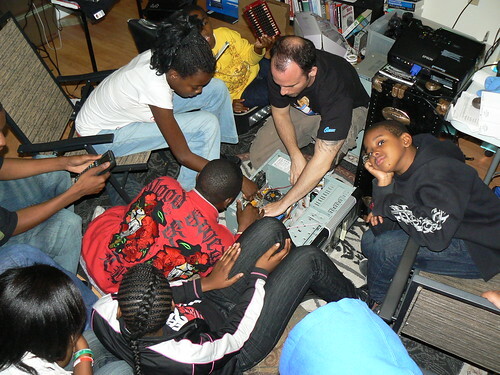 After talking about bit and 1 being on and 0 being off, Ryan asked the kids to look over at their new laptops and find the bit on the computer. This activity reminded me of a Dan Brown novel! My whole programming career, I have encountered this button and never noticed the symbol right in front of my face. Any doubts I had about the kids’ interest was fully squelched when Ryan, aided by a HowToons cartoon (see below), taught them how to count in binary using their hands. The kids got a kick out of this! The number four seemed to be particularly popular. 🙂 My favorite part involved a quiet kid in the back. Because of his silence, I had been trying to gauge his interest level. Then suddenly I spied him, with his hands very low near the keyboard, configuring his fingers to count to ten. When I walked the kids back home that night after class, I couldn’t help but feel excited about the eleven more sessions to come! P.S. Counting in binary has proven to have some staying power. On Saturday, four days after our first class, I took three girls up to Virginia Beach for an outing. And on the grassy hillside of Mount Trashmore, one started practicing her binary counting. The practice continued in the car and I coached the best I could through the rear view mirror. When we returned to Hunter Street, she proudly showed Ryan what she had rehearsed.